Step 1 Heat the oven to 350 degrees. Generously butter the sides of a 9-by-9-by-2 1/2-inch baking dish and set aside. Step 2 Heat a large, heavy-bottomed skillet over medium-high heat. Add the vegetable oil and bacon strips and cook, stirring frequently, until the bacon is almost crisp. Add the diced onion, and continue cooking until the onion is golden brown, 10 to 12 minutes. Remove from heat. Step 3Add the turkey, yams, Brussels sprouts and sage, and gently fold together to distribute the ingredients evenly. Season with one-fourth teaspoon each salt and pepper, or to taste, then transfer to the baking dish and gently press to create a level surface. Step 4To make the Gruyere cheese crust, combine the grated cheese, saltine crackers, pecans, butter and flour in a food processor. Briefly pulse until the mixture is coarsely chopped (about one-fourth-inch pieces) and mixed together. Distribute this mixture evenly over the top of the casserole. Step 5Place the casserole in the center of the oven and bake until the crust is golden brown, about 1 hour. In Recipes-list.com we have selected the most viewed recipes from category - Leftovers Main courses . Enjoy the best recipes specially selected for you! 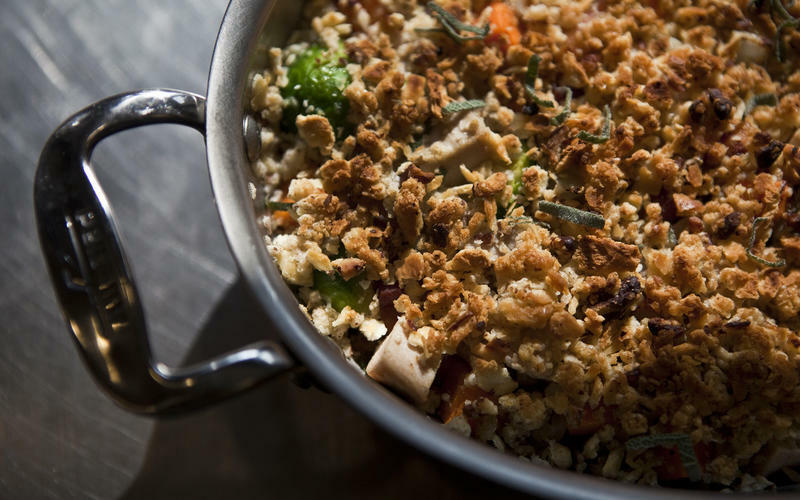 Turkey casserole is the right choice that will satisfy all your claims.